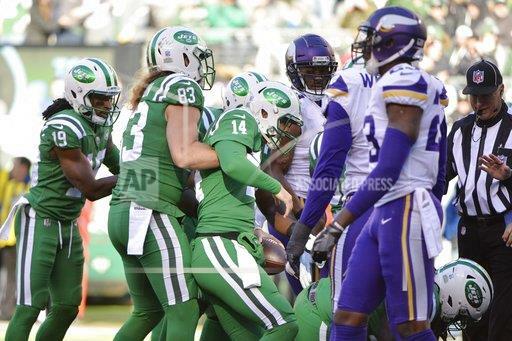 The New York Jets were riding on a TWO game WINNING streak going into today, but all the MOMENTUM is THROWN out the window when they got DEMOLISHED by the Minnesota Vikings at HOME today. The Jets fall to 3-4 on the season and they NEED to win their next FEW games if they want to make the Playoffs this season. The Vikings played in the NFC Championship game last season, so winning against them was going to be TOUGH for the Jets but then it got WORST with INJURIES towards the END of last week’s WIN against the Indianapolis Colts. Sam Darnold’s TWO best receivers, Terrelle Pryor and Quincy Enunwa are going to be SIDELINED for MULTIPLE weeks and safety Marcus Maye is also going to be OUT for a while. Between the INJURIES and the HEAVY winds in East Rutherford, ALL the cards were stacked AGAINST the Jets but they still HAD the OPPORTUNITY to WIN today but they DROPPED it away. The offense had a TON of drops that KILLED the MOMENTUM and the defense WORE DOWN in the FOURTH quarter resulting in a 37-17 LOSS to the Vikings. The offense was TERRIBLE today, they have to get A LOT better if they want to WIN some games because if they REPEAT this performance, than they are NEVER going to WIN a game again. The defense gave up a touchdown on the FIRST drive of the game, but it was able to SLOW DOWN the Vikings but they NEVER got that MOMENTUM setting TURNOVER and in the fourth quarter, they were GASSED and let the floor fall underneath them. Sam Darnold played in the COLDEST game of his NFL career, coming from California, this was probably the COLDEST game of his life for Sammy Touchdowns, but I have NO stats to back that up. He threw a touchdown AND rushed for a touchdown but a TON of balls were DROPPED by the Jets receivers and a COUPLE of them resulted in Interceptions. The defense is going to get TOUGHER next week, so he needs to play BETTER to WIN. The Jets travel to Chicago to take on the Bears next week who are on a TWO game LOSING streak. The Bears have a GREAT defense so if the offensive line is NOT able to PROTECT Darnold then it is going to be a LONG afternoon once again next week.